According to the recent studies, vitamin D deficiency can lead elderly people to various health conditions. That is why you need to have sufficient vitamin D even if you are in mature age such as over 50.Lack of vitamin D can lead you to risk of having osteoporosis, diabetes ,hip fractures, heart disease, arthritis, muscle weakness and many other conditions which can finally lead you to live with poor health conditions. If you think why seniors are at risk of vitamin D deficiency, let me explain a bit. Usually people get vitamin D naturally from sunlight. However when you are over 50 age, you also increase the risk of vitamin D deficiency. When people get older, they lose the ability to absorb or create vitamin D from the sunlight. On the other way, when you are not with good health, your chances of staying outside is also lesser. That will also tend to have lower chances of getting vitamin D from sunlight. Although you can get some portion of vitamin D from food such as milk and eggs, still you need to fulfill your daily vitamin D requirement. Also your daily need for vitamin D increases when you age. Having Vitamin D as supplements is the most intelligent way to assure that you are not with any vitamin D deficiency. 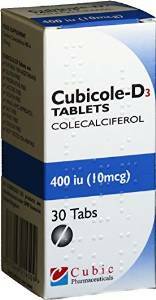 From reputed online stores such as Amazon you can easily buy Vitamin D supplements.You can check trusted brands such as Cubicole D3 as your vitamin D supplement.Cubicole D3 is a product of Cubic Pharmaceuticals and is a recommended supplement of vitamin D. It is known that all Cubic Pharmaceutical supplements are free from lactose, gluten, gelatin preservative and salt which are not suitable for a healthy lifestyle. Consider the risks of lack of vitamin D and make sure that you are getting enough daily intakes to enjoy a healthy lifestyle at your mature age! Previous Article← Improve your life with New Life Genetics DNA Tests!